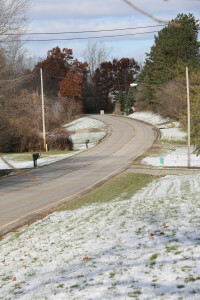 Atlas Twp.-On Tuesday, the township board of trustees OK’d a $2,500 bid from Flint based Rowe Professional Services for the scoping/pre- engineering of pathways along both sides of Ridge Road between Green and Hegel roads. The procedure must be completed before any applications are made for grant funding. In December Township Trustee Barry June sought bids for the project and Rowe was selected from three applicants. In addition, on Nov. 12, by a 5-0 vote the Goodrich Village council OK’d the trail project. The scoping/pre-engineering along about a mile of roadway that meanders near the village mill pond and Goodrich County Club should begin in the spring of 2019 following the bidding process. Johnson said the pathways would be a ADA sidewalks five foot wide. The ‘Walk, Bike, Run Atlas Township committee was formed in 2013 and gathered 358 signed petitions from residents in support of recreational paths in Atlas Township. The funds, for the scoping/pre-engineering project of Ridge Road will come from the recreational pathways fund. Revenue is generated by a millage of .125 or $6.25 per year taxable value $100,000 first approved by voters in November 2014 and then renewed last year. In October 2018 there was $129,000 in the trail fund which grows at a rate of about $40,000 per year. Johnson added the Walk, Bike, Run committee strives to incorporate the schools into the project. The Safe Routes to School is an international movement—and now a federal program—to make it safe, convenient, and fun for children, including those with disabilities, to bicycle and walk to school. When routes are safe, walking or biking to and from school is an easy way to get the regular physical activity children need for good health.